I recently discussed the immense differences between the Arcade and NES versions of Strider, this wasn't the first time Capcom altered the source material of an Arcade game to flesh it out for a home console. Most folks may not remember the Arcade version of Bionic Commando, but it was a brutally hard platformer, while it's NES counterpart contained the same play mechanics, but also featured a map component that gave players specific objectives for certain missions. The NES version has been considered a timeless classic, with a remake, entitled Bionic Commando: Rearmed, being released a few years ago. This remake was developed and released in conjunction with a sequel to the NES game that was released on PS3, Xbox 360, and PC. Almost as expected, nostalgia won out, and Rearmed was praised by critics and gamers alike, while the sequel, simply titled Bionic Commando, received mixed reviews. 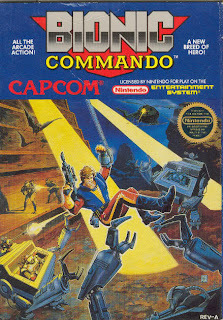 Most gamers who trace their roots in gaming back to either before or just after the crash of 1983 can remember games like Bionic Commando with great fondness, mainly because this was a time when game manufacturers could not afford to waste money on bad video games. It was a time when consumers were better informed about video games they spent money on (which is ironic considering how many different "experts" are on the Internet now). I advise folks who aren't old enough to remember Bionic Commando in its earliest forms to give it a try, and get to know your roots. The first two videos remind me of how Mega Man for the NES looks with it's platform style. Don't think I've ever seen the one in the third video, though. Let's Get This Clear...Video Games Are Art! !